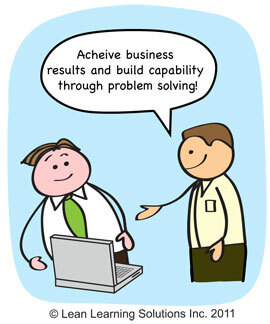 “We don’t do Lean for Business Results we do it to build capability”. How many times have you heard that? I hear it a lot. And unfortunately the people who say it have got things twisted around a bit. Of course we implement Lean to achieve improved business results. It’s the way we achieve them that’s different. The primary role of leaders is to achieve business results. If leaders don’t achieve business results, they won’t be leaders for very long. So we need to achieve results but we need to do it in a way that engages all our people in solving problems. For them to do that we need to build their capability. We need to build their capability to solve problems and we need to build their technical and social skills as well. The higher the capability of our people, the more problems they can solve. The more problems they solve, the better our business results. Therefore, the second role of leaders is to build the capability of the people in their organization. Lastly, we need to achieve results and build capability in a way that’s consistent with the values of the organization. Showing respect for our people and challenging them to solve problems that stretch their capability. This way they are always growing and learning. The problems our people work on need to drive improvement for the Customer, for the Employee and for the Organization. When we look at business results, we’re not just looking at a narrow view of the organization financials; rather we need to take a broader view that encompasses all three areas. We need to engage people to solve problems and remove waste to drive improvement for the Customer, the Employee and the Organization. By doing this our business results get better. So Lean is about business results and it’s about developing capability in people to solve problems to help achieve them.